Static content and regular blog posts are often no longer sufficient to engage website visitors and boost time on site. Visitors expect your content to be interactive, at least to some extent, and website owners should explore their options to provide it. The trend can even be seen on social platforms that enable users to embed video, animation, and interactive content as well as many other sites that are adopting live video streams. You cannot afford to miss this trend as consumers are getting accustomed to various types of interactive content and are more and more willing to share personal details in exchange for interactivity. A business can collect marketing data passively, but this approach limits your chance for growth, as it does not provide enough info on your customers’ preferences and prevents you from building proper buyer personas. Furthermore, interaction with customers creates both trust and engagement that results in more loyal customers and helps you boost retention rates. 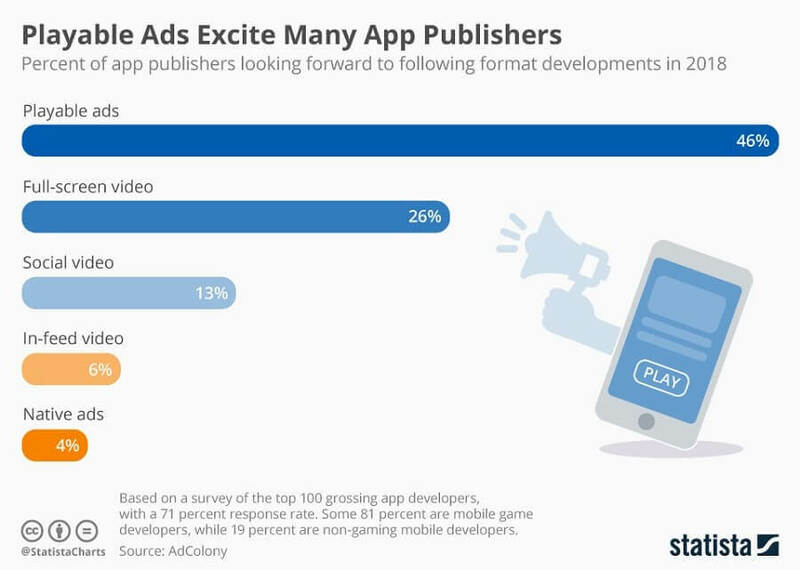 App makers, for instance, are getting increasingly excited about playable ads to boost the overall impact of a particular piece of content. The same applies to interactive content that is not advertising but is intended to collect feedback from customers and build a viable marketing strategy. 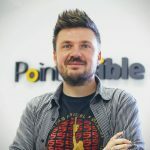 Selecting the right type of interactive content and finding the balance between static and interactive content can make the difference between visitors staying longer on your site or leaving annoyed by intrusive marketing techniques. So, let’s explore what interactive content options you have and how they work. This is probably the oldest method to interactively collect customer feedback and test if your customers are willing to buy a new product or service. Most surveys come with an option to get updates on future products and services but you should be careful about obtaining customer’s consent for updates in the light of the GDPR regulations. There are many mistakes you can do with a survey that can reduce its effectiveness so be sure you know what you are doing when you decide to run it. These content types are popular because they are inherently fun and are always associated with a certain reward. Depending on your approach, they can be strictly there to engage your audience and raise awareness about something, or they can double down on providing you with a useful information. While the latter tend to be way more effective conversion wise, they can be challenging to create. For example, a useful calculator had to be based on correct information and provide accurate results. Otherwise, it is just there for show. Here are some tips on how to create quizzes, calculators, and social media contests. When done right, all of these interactive content types will naturally boost your engagement rates and keep visitors on your site. A good assessment tool can increase time on site but it also can help you generate more leads and customers. By offering a free interactive tool that makes suggestions about the most suitable product or service a visitor can choose, you collect info about both the particular visitor, his problem and the solution he chooses. It can be invaluable from a marketing point of view while providing the customer with valuable and engaging interactive experience. Both marketers and advertisers are eager to place more video online as video and animation are emerging as one of the preferred content formats. You can take advantage of interactive video to create different marketing content such as pools, forms, or assessments. Nonetheless, do not overuse this format and carefully consider whether the auto-play function is appropriate. Interactive infographics are a good method to gain a visitor’s attention and make him explore the data more thoroughly. They have one more advantage – you generally cannot make a good screenshot of them unless you explore them in detail, which in turn increases time on site. An interactive whitepaper is similar to a detailed graph but with more text to explore. You can embed interactive content such as an assessment or a test into your whitepaper, making it even more appealing. Creating content is one thing; creating engaging content is another. You need to retain your customers after their first visit to your site. More importantly, you need customer engagement to build loyalty and generate leads. Overall, nearly a half of B2B marketers find that creating engaging content is one of the three most challenging tasks they face in 2014, a survey by the Content Marketing Institute reads. A couple of years later, 60 percent of the respondents say that creation of truly engaging content is their top task. And for a good reason. Everyone is creating content these days and standing out from the crowd is getting harder by the day. Interactive content can help both B2C and B2B websites in attracting and retaining visitors while finding the right mix for each particular business is still a challenge. Additionally, creating interactions for the sake of interactivity does not help you much. You need a meaningful content strategy that envisages the use of the most proper content type, in the right sections/pages, and for the right customer. You should start by properly placing your interactive content to grab the visitor’s attention and make him wish to explore more. Selecting the right type of interactive content and the right placement spot on your site is just the first step. Once the visitor has engaged in exploring this initial content, you can offer more of interactive content to lead them down the marketing funnel. 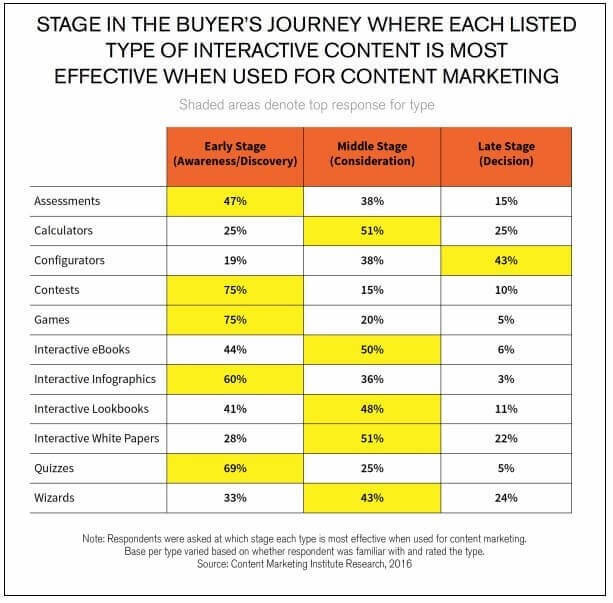 As you can see from the picture above, interactive content is not that effective in “sealing the deal” but works quite well in the beginning and the middle of the marketing funnel. However, you should not concentrate only on its type but on the topic/area you want to cover because that is what decides in which phase of the funnel your content belongs to. Expecting that interactive content will increase time on site and retain visitors just by being there is a huge mistake. Interactive or not, content needs to appeal to your target audience to actually be effective. Otherwise, you are just throwing your money down the drain. Another feature of interactive content you should utilize to the utmost is the possibility to interact with your customers in real time. So, if you are doing something like a live webinar and the chat starts to get active, us that chance to respond to the comments to keep the audience engaged. Last but not least, use marketing psychology by taking advantage of methods that create urgency for action, provoke visitors’ curiosity, and force them not to miss an offer. Whenever you try to get your prospects interested in your interactive content, always keep in mind that people tend to react more on the fear that they are going to lose something than on the ability to gain something. Thinking visually is a must as interactive content offers great opportunities to represent a lot of info in a visual way. Make it fun and engaging while incorporating the desired message you want to convey. Besides the visuals, don’t forget to ensure that the interaction with the content is easy and intuitive. You don’t want to waste money on creating interactive content just for your audience to bounce because they got stuck while using it. Despite being slightly more complicated to develop than your standard blog post, interactive content offers many benefits and it seems it is here to stay. It is as good time as any to give it a try. Passionate about digital marketing, entrepreneurship, growth and travel, Senko is also a co-founder of Diversis Digital and Point Visible digital marketing agency. Loves testing new ideas, projects with unclear specifications and fighting pressure with chill out attitude. Senko Duras, thank you for your blog post.Really thank you! Awesome.